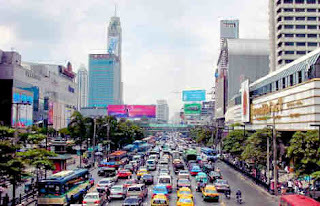 While I've only lived in Bangkok for two years, there has already been a lot of madness in this city: a near civil war, unexplained grenades exploding, rumors of a coup, massive corruption, and numerous shenanigans. And that's just what's in the news. Beneath the smiles on pretty faces that the Tourist Authority of Thailand pushes and the cheap beer joints in the guidebooks, there is a city with a very rough edge to it. In this chaotic landscape, you find some fascinating people trying to hustle and get by on a day-to-day basis. People from all walks of lives have completely unique and interesting tales to tell. However, judging by the a lot of books published about Bangkok (in English), there seems to be only two things going on Bangkok: 1) Foreigners trying to scam naughty bar girls, 2) Foreigners stuck in Thai prison, and 3) Foreigners inconvenienced by various bouts of civil unrest. Not to say that these topics aren't of interest, but I humbly believe that there is a lot more to this city than what appears to be available. Here's an interview with author Collin Piprell where he discusses this dilemma. Hopefully, I can find a niche for people looking for something different about this intense place.